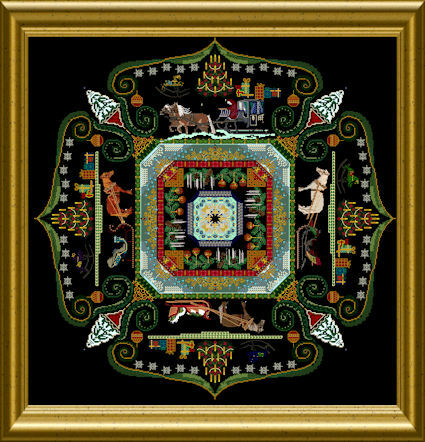 Important note: The Châtelaine Christmas Mandala Mystery was one of the last designs, Martina Rosenberg worked on. For this reason, the usual instructions are missing. Also, it is not in 12 parts as announced but comes in one complete part. You can get help as usual in the Châtelaine Support Group on Facebook. 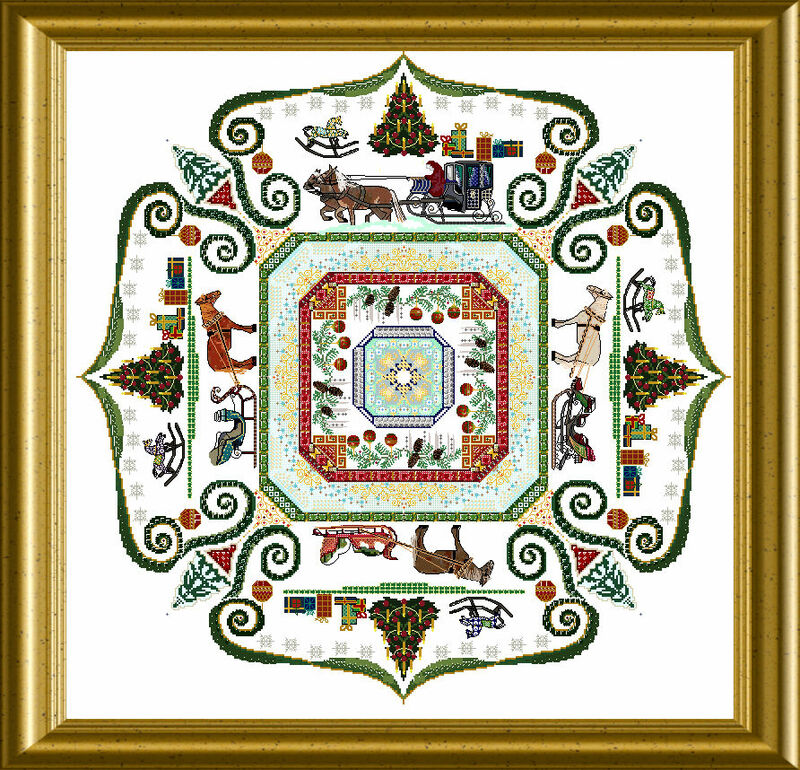 The first Châtelaine Christmas MANDALA Mystery ever! You can sign up unseen, just enjoying the suspense and clinging to the hints and morsels I make known publicly or you can join in all time through 2018 still, once you can seee the first bits and parts beeing published. This Christmas Mystery will have 12 parts – one for each month! It will start on December 1st, 2017 and end in November 2018 – so with a little luck and busily stitching, you may have finished the embroidery ready in time for the Holiday in next year! Each month brings you a part – 12 parts are made – so after one year you can have finished a really large and complex embroidery. It will be a BIG Mystery. Size 365 x 365 stitches, mere design size. Plan for a nice addition of fabric to hold and frame! It will feature Christmas themes, symbols and topics, without being explicitely christian, it celebrates this Holiday, so will perhaps not be fit for somebody with a different religion. The color scheme will be classic: Red Green Gold Silver White. With a bit of fur colors here and there 😉 But the main colors are the traditional Xmas colors in all their glory. We will use a variety of different threads, cotton, silk, metallic. There will be beads, crystals, tiles and ?? 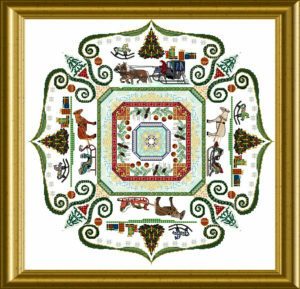 to sew on and make this a sparkly, splendid festive design to adorn your home in the most festive of seasons. You will have a little hand full of Christmas Spirit throughout the year…. 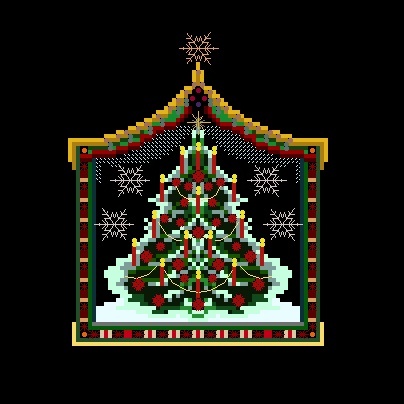 If you purchase this design/project, you will receive a free small “test” design of a Christmas Tree to enjoy. Most of the threads used in the large design will be used in the small one too! This offer is only valid throughout the runtime of the Mystery. After this time, the small will be only available for sale and no longer be part of this “package”! This is so awesome Martina! In fact, I was just going to email you to ask if you had considered designing a Christmas mandala!! Can’t wait for this to start! Love those colours for xmas. Sounds elegant! Can’t wait to see it! Glad it will be in traditional Christmas colors. Can you give any suggestion yet as to fabic color? I think it will be best on white or cream – perhaps a light blue…. Oh how WONDERFUL. I had already started to worry if I would be able to see after stitching this BEAUTY on black. This sounds like it will be amazing! Totally want to do this. Can’t wait. Confused…Is the image shown the actual project? Love this one so much! Part one already promised so much ! Will be happy to take any further pieces even if not finished….. would be such a wonderful legacy. So, if you purchased this are you refunding back some of the money since you are not receiving all of the parts? Asking as $45 seems a little high for just one part. All 12 parts are combined in one part. The sold content is completely available. Thank you for that bit of holiday cheer! How long time Christmas tree up after Christmas? It is really amazing and impressive.